The RX audio processing platform just keeps getting better. Creative as well as ingeniously practical. Like a fan waiting for the new album, we are wary that excitedly jumping into RX5 could end in an unsatisfying 'meh'. It's hard to imagine an update providing the same rush of 'you can do what?!' moments as our first encounter with RX. As this is ostensibly an update, as opposed to a rewrite, we shall focus on the additions and enhancements here. The first addition is Instant Process, a tool for speeding up repetitive tasks. When engaged, the user can choose a module function (Attenuate, De-Click, Fade, Gain, Replace) which is applied as soon as a selection is made. Luckily the undo history window is on hand when you select faster than you can think/review. Workflow is further augmented with Module Chain, a one- click process tool created from chains of user-defined module functions. The chains are fully editable and individual functions can be toggled and tweaked. All RX5 packages receive a new module in the form of Corrective EQ, a comprehensive six-band parametric EQ with high and low-pass filters. All EQ bands have bell/shelving options and a Q that reaches a laser-like surgical tip of 400, while the filters have four cutoff knee shapes. The Analog/Digital modes further expand the tonal qualities of this impressive EQ. The Advanced package includes new Signal Generator and De-plosive modules, though the former is not found in the Module Panel but in the Process menu, with parameters set via the Window menu, an oddity in this otherwise intuitive system. The module provides a full set of tone and noise generation tools as well as a silence function that includes a DC Offset slide, which if used in 'Mix' paste mode can adjust/add offset for practical and creative purposes; we see fun ahead! De-plosive provides a simple but effective process for saving overly close-up, Poppy voice recordings, like a de-esser for the low-end, though it proves a cool tool for adjusting the 'thump' on drum hits, helping reshape a tubby snare for example. iZotope has made the De-reverb module standard to all RX5 packages (it was Advanced only), which is good news as it is a great tool for drying up recordings, be they vocals, foley or instruments. Post production usage benefits from a new Marker/Region search function, and voice production gains Ess reduction/Breath control settings in the Leveler module, making it even easier to set consistent voice/vocal levels without the artefacts of compression. A host of new presets includes a set of background soundbeds (city, outdoors, warehouse, etc) in the Ambience Match module, providing an excellent starting point for voice tracks and foley, even if it's just for a scratch edit. 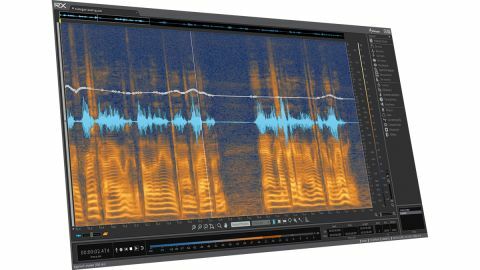 RX5 is a remarkable set of tools for anyone serious about audio editing, and the unrivalled DAW integration is the icing on the cake: check out the Connect and Monitor plug-ins. Worth every penny with regard to the Standard Audio Editor toolset, and equally so for the Advanced/Post-Production if your work justifies the expenditure.